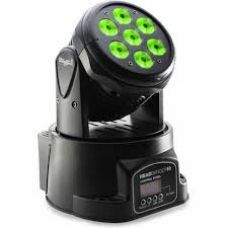 Moving Light with IRC-6 Control!Energize your audience with the fun and excitement of Chauvet's Inti.. The Stagg Pro Lighting Headbanger 10 is a compact moving wash light with 7x 10W RGBW LED chips, prov.. LED Moving Head with 7 x 10W RGBW 4-in-1 LED's HeadBanger 10Output: 6.100 Lux @ 1m Lens: 25degr..